1. IT’S THE WASTE OF A DIMENSION. When you look at a 2-D movie, it’s already in 3-D as far as your mind is concerned. When you see Lawrence of Arabia growing from a speck as he rides toward you across the desert, are you thinking, “Look how slowly he grows against the horizon”? Our minds use the principle of perspective to provide the third dimension. Adding one artificially can make the illusion less convincing. 2. IT ADDS NOTHING TO THE EXPERIENCE. Recall the greatest moviegoing experiences of your lifetime. Did they “need” 3-D? A great film completely engages our imaginations. What would Fargo gain in 3-D? Precious? Casablanca? 3. IT CAN BE A DISTRACTION. Some 3-D consists of only separating the visual planes, so that some objects float above others, but everything is still in 2-D. We notice this. We shouldn’t. In 2-D, directors have often used a difference in focus to call attention to the foreground or the background. In 3-D the technology itself seems to suggest that the whole depth of field be in sharp focus. I don’t believe this is necessary, and it deprives directors of a tool to guide our focus. 4. IT CAN CREATE NAUSEA AND HEADACHES. AS 3-D TV sets were being introduced at the Consumer Electronics Show in Las Vegas in January, Reuters interviewed two leading ophthalmologists. “There are a lot of people walking around with very minor eye problems—for example, a muscle imbalance—which under normal circumstances the brain deals with naturally,” said Dr. Michael Rosenberg, a professor at Northwestern University. 3-D provides an unfamiliar visual experience, and “that translates into greater mental effort, making it easier to get a headache.” Dr. Deborah Friedman, a professor of ophthalmology and neurology at the University of Rochester Medical Center, said that in normal vision, each eye sees things at a slightly different angle. “When that gets processed in the brain, that creates the perception of depth. 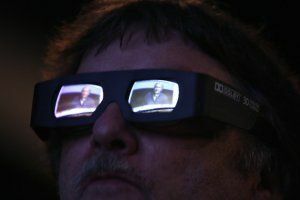 The illusions that you see in three dimensions in the movies is not calibrated the same way that your eyes and your brain are.” In a just-published article, Consumer Reports says about 15 percent of the moviegoing audience experiences headache and eyestrain during 3-D movies. 5. HAVE YOU NOTICED THAT 3-D SEEMS A LITTLE DIM? Lenny Lipton is known as the father of the electronic stereoscopic-display industry. He knows how films made with his systems should look. Current digital projectors, he writes, are “intrinsically inefficient. Half the light goes to one eye and half to the other, which immediately results in a 50 percent reduction in illumination.” Then the glasses themselves absorb light. The vast majority of theaters show 3-D at between three and six foot-lamberts (fLs). Film projection provides about 15fLs. The original IMAX format threw 22fLs at the screen. If you don’t know what a foot-lambert is, join the crowd. (In short: it’s the level of light thrown on the screen from a projector with no film in it.) And don’t mistake a standard film for an IMAX film, or “fake IMAX” for original IMAX. What’s the difference? IMAX is building new theaters that have larger screens, which are quite nice, but are not the huge IMAX screens and do not use IMAX film technology. But since all their theaters are called IMAX anyway, this is confusing. 6. THERE’S MONEY TO BE MADE IN SELLING NEW DIGITAL PROJECTORS. These projectors are not selling themselves. There was initial opposition from exhibitors to the huge cost of new equipment and infighting about whether studios would help share these expenses. Some studios, concerned with tarnishing the 3-D myth, have told exhibitors that if they don’t show a movie in 3-D, they can’t have it in 2-D. Although there’s room in most projection booths for both kinds of projectors, theaters are encouraged to remove analog projectors as soon as they can. Why so much haste to get rid of them? Are exhibitors being encouraged to burn their bridges by insecure digital manufacturers? 7. THEATERS SLAP ON A SURCHARGE OF $5 TO $7.50 FOR 3-D. Yet when you see a 2-D film in a 3-D-ready theater, the 3-D projectors are also outfitted for 2-D films: it uses the same projector but doesn’t charge extra. See the Catch-22? Are surcharges here to stay, or will they be dropped after the projectors are paid off? What do you think? I think 3-D is a form of extortion for parents whose children are tutored by advertising and product placement to “want” 3-D. In my review of Clash of the Titans, I added a footnote: “Explain to your kids that the movie was not filmed in 3-D and is only being shown in 3-D in order to charge you an extra $5 a ticket. I saw it in 2-D, and let me tell you, it looked terrific.” And it did. The “3-D” was hastily added in postproduction to ride on the coattails of Avatar. The fake-3-D Titans even got bad reviews from 3-D cheerleaders. Jeffrey Katzenberg, whose DreamWorks has moved wholeheartedly into 3-D, called it “cheeseball,” adding: “You just snookered the movie audience.” He told Variety he was afraid quickie, fake-3-D conversions would kill the goose that was being counted on for golden eggs. 8. I CANNOT IMAGINE A SERIOUS DRAMA, SUCH AS UP IN THE AIR OR THE HURT LOCKER, IN 3-D. Neither can directors. Having shot Dial M for Murder in 3-D, Alfred Hitchcock was so displeased by the result that he released it in 2-D at its New York opening. The medium seems suited for children’s films, animation, and films such as James Cameron’s Avatar, which are largely made on computers. Cameron’s film is, of course, the elephant in the room: a splendid film, great-looking on a traditional IMAX screen, which is how I saw it, and the highest-grossing film in history. It’s used as the poster child for 3-D, but might it have done as well in 2-D (not taking the surcharge into account)? The second-highest all-time grosser is Cameron’s Titanic, which of course was in 2-D. Still, Avatar used 3-D very effectively. I loved it. Cameron is a technical genius who planned his film for 3-D from the ground up and spent $250 million getting it right. He is a master of cinematography and editing. Other directors are forced to use 3-D by marketing executives. The elephant in that room is the desire to add a surcharge. Consider Tim Burton, who was forced by marketing executives to create a faux-3-D film that was then sold as Alice in Wonderland: An IMAX 3D Experience (although remember that the new IMAX theaters are not true IMAX). Yes, it had huge grosses. But its 3-D effects were minimal and unnecessary; a scam to justify the surcharge. Even Cameron plans to rerelease Titanic in 3-D, and it’s worth recalling his 3-D documentary, Ghosts of the Abyss, which he personally photographed from the grave of the Titanic. Titanic 3-D will not be true 3-D, but Cameron is likely to do “fake 3-D” better than others have. My argument would nevertheless be: Titanic is wonderful just as it stands, so why add a distraction? Obviously, to return to the No. 2 cash cow in movie history and squeeze out more milk. I once said I might become reconciled to 3-D if a director like Martin Scorsese ever used the format. I thought I was safe. Then Scorsese announced that his 2011 film The Invention of Hugo Cabret, about an orphan and a robot, will be in 3-D. Well, Scorsese knows film, and he has a voluptuous love of its possibilities. I expect he will adapt 3-D to his needs. And my hero, Werner Herzog, is using 3-D to film prehistoric cave paintings in France, to better show off the concavities of the ancient caves. He told me that nothing will “approach” the audience, and his film will stay behind the plane of the screen. In other words, nothing will hurtle at the audience, and 3-D will allow us the illusion of being able to occupy the space with the paintings and look into them, experiencing them as a prehistoric artist standing in the cavern might have. 9. WHENEVER HOLLYWOOD HAS FELT THREATENED, IT HAS TURNED TO TECHNOLOGY: SOUND, COLOR, WIDESCREEN, CINERAMA, 3-D, STEREOPHONIC SOUND, AND NOW 3-D AGAIN. In marketing terms, this means offering an experience that can’t be had at home. With the advent of Blu-ray discs, HD cable, and home digital projectors, the gap between the theater and home experiences has been narrowed. 3-D widened it again. Now home 3-D TV sets may narrow that gap as well. What Hollywood needs is a “premium” experience that is obviously, dramatically better than anything at home, suitable for films aimed at all ages, and worth a surcharge. For years I’ve been praising a process invented by Dean Goodhill called MaxiVision48, which uses existing film technology but shoots at 48 frames per second and provides smooth projection that is absolutely jiggle-free. Modern film is projected at 24 frames per second (fps) because that is the lowest speed that would carry analog sound in the first days of the talkies. Analog sound has largely been replaced by digital sound. MaxiVision48 projects at 48fps, which doubles image quality. The result is dramatically better than existing 2-D. In terms of standard measurements used in the industry, it’s 400 percent better. That is not a misprint. Those who haven’t seen it have no idea how good it is. I’ve seen it, and also a system of some years ago, Douglas Trumbull’s Showscan. These systems are so good that the screen functions like a window into three dimensions. If moviegoers could see it, they would simply forget about 3-D.
I’m not opposed to 3-D as an option. I’m opposed to it as a way of life for Hollywood, where it seems to be skewing major studio output away from the kinds of films we think of as Oscar-worthy. Scorsese and Herzog make films for grown-ups. Hollywood is racing headlong toward the kiddie market. Disney recently announced it will make no more traditional films at all, focusing entirely on animation, franchises, and superheroes. I have the sense that younger Hollywood is losing the instinctive feeling for story and quality that generations of executives possessed. It’s all about the marketing. Hollywood needs a projection system that is suitable for all kinds of films—every film—and is hands-down better than anything audiences have ever seen. The marketing executives are right that audiences will come to see a premium viewing experience they can’t get at home. But they’re betting on the wrong experience.